Ken Hermes works for the Lions Barber Collective. We invite you to read his story and write a response to him at the bottom of the page. Your feedback will be collated to let Ken see how he has influenced our readers, and to encourage others to join the conversation by sharing their own thoughts. I’m what they call a survivor of suicide, which is a strange thing to call it. Suicide. It’s a horrible word. It sends shivers down your spine and brings up barriers in most people. It is the single biggest killer of under 45s in the UK. A staggering 80% of cases are men. Statistics show that somebody takes their life every 120 minutes in the UK. With this being such a huge issue, why do we feel that we can’t speak about it and the mental health conditions that link to it? I lost my dad to suicide when I was 15. There was no note, no warning. One day I woke up and he wasn’t there anymore. It hit me really hard. My dad and I were best friends, we were so close. The night before he died we had a normal night. We were smoking and drinking, I was playing his favourite songs on my guitar, we talked about everything. It felt that night like he was really wearing his heart on his sleeve, but he didn’t tell me how depressed he was feeling, I had no idea. I didn’t even know my dad took antidepressants. I was only young, he was probably trying to protect me. As time passed, I felt that I couldn’t talk to anyone about what I was going through anymore, everyone had grown tired of hearing it. Kids at school blocked me out, there was clearly a big taboo around the subject. I don’t think my dad had anyone to speak to in that respect either. Maybe it was a pride thing. His pride may have cost him his life. I haven’t felt able to speak out until now. Until the Lions Barber Collective came about. When I heard that barbers were raising awareness of suicide, I knew I had to get involved, but I had no way of knowing how big this project would become. It started slow. I was asked to film a short video blog explaining my loss and why I – a non-barber – was getting in with a group of barbers. That video had 14,000 views in seven days. It proved to me that speaking out not only helped me, but could help others that have lost, or are going through depression themselves. Together with founders Tom Chapman and Pat Barry, we are developing training that has never been seen before. The truth is that men will speak to their barbers about things they wouldn’t tell anybody else. 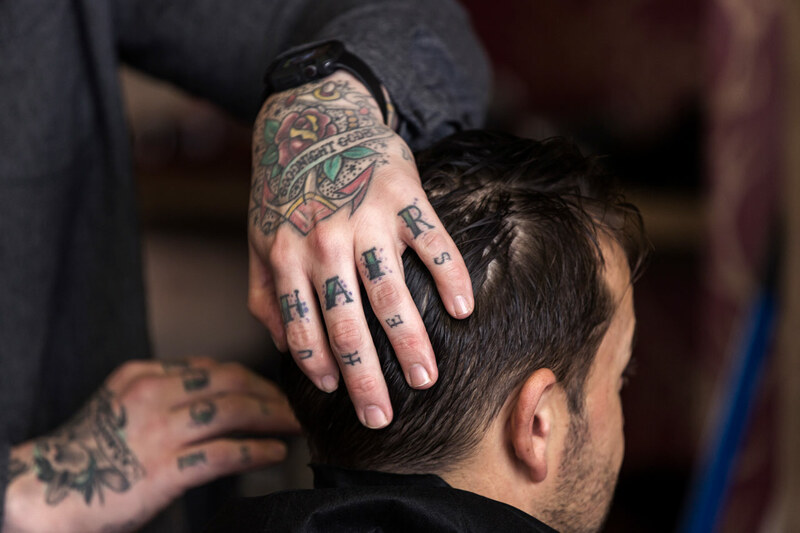 The #BarberTalk program teaches barbers how to recognise, talk, listen and advise their clients. With this comes the responsibility to remain confidential, provide a safe haven for clients, and offer help where necessary. Talking about suicide does not make it more likely to happen. By breaking the taboo, we could save a life. Society is slowly accepting the conversation, so why not talk to your barber? Thank you for reading Ken’s story, now we’d like to hear from you. We invite you to share your own thoughts and experiences in relation to the story, publicly or anonymously. A selection of your contributions will be published on this page, to give feedback to the author and to start a new conversation.